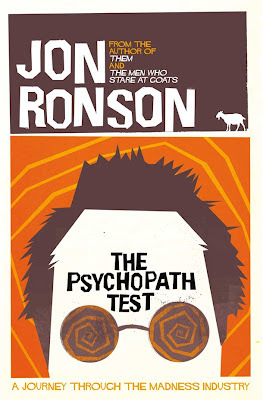 Jon Ronson, author of Them and The Men who Stare at Goats (both I haven't read and now I'm considering to buy and read them), started his journey in madness world when he got invited from his colleague, Deborah Talmi, to investigate a book titled Being or Nothingness. Someone sent copies of this book to academics around the world, most of them were neurologists. Ronson solved the case. He succeeded in knowing who sent the book. But, it didn't end there. In fact, this investigation made him thinking. I thought about my own over-anxious brain, my own sort of madness. Was it a more powerful engine in my life than my rationality? I remembered those psychologists who said psychopaths made the world go around. They meant it: society was, they claimed, an expression of that particular of madness. In beginning of his journey, he met a man named Toni. Toni faked his own madness. He wanted to avoid a prison cell for his crime, in return he got his own "cell" in Broadmoor Hospital. All psychiatrists that assessed him made a diagnose that he was a psychopath. Once you're diagnosed as psychopath, you'll bear it for the rest of your life. You can't be healed. A psychopath is considered as dangerous. Often serial killers are diagnosed as psychopath and they are apt to do their crimes over and over. Because of that if someone is diagnosed as psychopath, he'll stay in asylum forever. Ronson also took a three-day seminar from Bob Hare. In that seminar, he learned to spot a psycopath. Armed with Hare PCL-R and his new spot skill, he went to see Emmanuel 'Toto' Constant and Albert John Dunlap. During the interviews, probably because of their manipulative, Ronson once had a doubt whether Toto and Al Dunlap were psychopaths or not. In the end, he's convinced that both of them were psychopaths. It turned out, it's not only criminals who are psychopathy, but also businessmen are. I'm talking about Al Dunlap who got nicknames "Chainsaw Al" and "Rambo in Pinstripes". Throughout this book, I read not only about psychopaths, but also about "the dark side" of psychology. Scientologists discredit psychologists and psychiatrists. I guess what's on scientologists' mind maybe like this, "How dare psychologists and psychiatrists tell people that they are suffering for some kinds of freaking mental disorders! What if they misdiagnose people?" Yes, what if? On chapter 10, "The Avoidable Death of Rebecca Riley", Ronson talked about misdiagnose. If you're curious who Rebecca Riley was, you can read about Rebecca Riley in here, here, and here. Conclusion is when a psychiatrist (or a psychologist or a doctor, whoever) misdiagnose his or her patients, their lives are at stake here. For that matter, Ronson came to Robert Spitzer, the editor of DSM (Diagnostic and Statistical Manual of Psychiatric Disorders) III and IV. Ronson asked Spitzer about the possibility that he'd inadvertently created a world in which some ordinary behaviours were being labelled mental disorders. ...he fell silent. I waited him for an answer. But the silence lasted in three minutes. Finally he said, "I don't know." "Do you ever think about it?" I asked him. "I guess the answer is I don't really," he said. "Maybe I should. But I don't like the idea of speculating how many of the DSM-III categories are describing normal behaviour." "Why don't you like speculating on that?" I asked. "Because then I'd be speculating on how much of it is a mistake," he said.